We can solve any problem/conflict with wild animals. 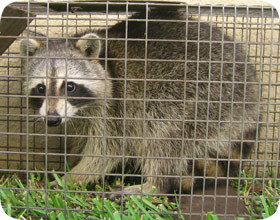 We not only trap critters, we offer a full line of complete solutions for wildlife problems. WILDLIFE TRAPPING: We provide humane wildlife trapping services. We set as many traps as are necessary at the property (usually 2-4) and return on the day of any animal capture to remove and relocate the critter. We take great care in making sure the animals are not harmed, and we always take every step to capture the target animal(s). ANIMAL DAMAGE REPAIRS: We can repair any damage that animals have done to your home. From raccoons tearing a hole in the roof, to squirrels gnawing through the fascia board, we fix the damage. CRITTER PROOFING: The most important step in solving a wildlife problem is sealing off any entry points into a building that allow wildlife to gain access. We completely critter-proof the house, with guarantee, so that no more wild animals will be able to enter. ATTIC CLEANUP: Wild animals often leave their waste, nesting material, food, and parasites in an attic. We remove all of the waste and decontaminate the attic in order to eliminate any health risks associated with wild animals, and to destroy the critter odors that may attract new animals to your attic. DEAD ANIMAL REMOVAL: If you have a horrible smell inside your house, it's likely a dead animal decaying in the attic or walls. Or perhaps you have a dead animal under your house or shed or somewhere on your property. We remove the carcass and deodorize the area. BAT & BIRD CONTROL: We specialize in large and difficult bat and bird infestation problems. We safely remove all of the unwanted animals, and we ensure that they will not be able to re-gain access to your home/building again. Will the city or county animal services help me with a wildlife issue? It is not necessarily within your city's or county's animal services to take care of your wildlife problem. In that case your next option would to call private wildlife removal service which may cost a lot of money though do get the job done. Critters are scavengers which means they will look for food just about anywhere. They are also omnivores which means that they will just about anything. This makes for a very determined and pesky animal who will end up rifling through your trash in the middle of the night and leaving a very big messy in its wake. Critters are carries of many diseases such as rabies, leptospirosis and tularemia just to name a few. These can then be transmitted into pets or even humans if you were to come into contact with them or get bitten by the fleas that they were carrying. Shooting - Though not the safest or most effective method, this is still a possible solution for you. If just happen to be one of those few very skilled people who can hit a moving target like wildlife, in one shot and kill right away, then maybe this method is for you. But otherwise, it shouldn't not be a considered option for most people. Trapping - The most common solutions and one that most people can use in order to get rid of their wildlife problem. There are many traps available on the market today that makes for easy catch and release. Fencing - Another effective way of keeping wildlife away from your property and a particularly more long-term solution. All you have to do is erect a fence around your property that is at least 3 feet high and at least one foot deep into the ground. Critters are not particularly good diggers but they can dig and could potentially slip through a hole underneath your fence that is big or wide enough for them to pass. Modifying - While the last two solutions can be quite expensive and time-consuming, this last method doesn't have to be. All you have to do is make sure that your yard or garden is clean and clear of any debris in which an wildlife can use as food or shelter which will then attract them to your property. Take those things away, and the wildlife will also disappear. Local city or county animal service don't necessarily have the equipment or expertise in handling wild animals such wildlife and usually will not be able to help you in situations such as wildlife removal on a property. You could ask the services of a private wildlife removal expert however, if you are strapped for cash, this may not be an option. Your only other solution are in trying the above mentions alternative solutions and hopefully, you will be wildlife-free soon enough! © 2003-2016 pestanimalcontrolchicago.com - site content, photos, & maintenance by Chicago Animal Pest Control, all rights reserved.